Microsoft Windows 10 comes with a new web browser named as Microsoft Edge. The browser was earlier named as Spartan. However, Microsoft released the stable version of the web browser as Microsoft Edge. The Microsoft Edge is a step ahead from the Microsoft Internet Explorer, and it comes with smooth browsing experience. Though, the browser is yet to get some of the basic features such as restoring tabs and saving a group of tabs for later use and more importantly, the promised extension or add on support. On the other hand, there is Chrome, one of the most popular web browser. Both the browsers have their own pros and cons while Chrome is leading the chart table, except for an error which is common to both the web browsers. The error is “can’t connect to the proxy server” and it will appear on your Chrome or Edge browser when you try to open any web page. Though this error usually appears on Chrome and Edge web browser, you may also see this error in Mozilla Firefox web browser. Even though the error message says that the browser is unable to connect to the proxy server, there is no go-to solution for this error. All you can do is try different fixes to fix “can’t connect to the proxy server” error in Edge and Chrome. Below are some of the solutions to fix the “can’t connect to the proxy server” error. Also see fix an error occurred while checking for update in Chrome. The first step to resolving the “can’t connect to the proxy server” is disabling the VPN client in your PC. Though, this is only applicable if you have a working VPN client installed. Open your VPN client if its is running and disconnect from the internet by clicking on the disconnect link on your VPN client. Once the VPN client has been disconnected, close and exit it. Now open Edge or Chrome browser and try to open any web page and see if the error has been resolved. If not, try fix 2. 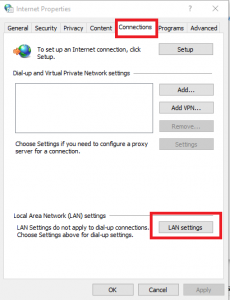 If the above method didn’t work for you, then you can try disabling the proxy for LAN settings from the Internet settings. Follow these steps to know how to do it. Open Control Panel and go to Network and Internet. Click and open Internet Options. It will open a new Internet Properties dialogue box. Click the Connections tab and click on LAN settings at the bottom. It will also open a new dialogue box. 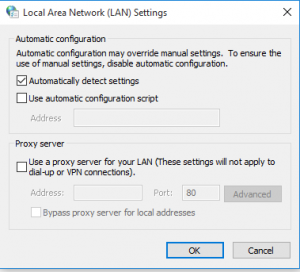 At the bottom find Proxy Server section and uncheck the box “Use the proxy server for your LAN (These settings will not apply to Dial-up or VPN connection). Also, check the box “Automatically detect settings”. Click on OK to save the settings. Then click Apply and OK to save the Internet Properties settings. Now open Google Chrome or Edge and try to open any web page. If everything went right, you should not see the “can’t connect to the proxy server” error. I am unable to uncheck the “Use the proxy server for your LAN settings” or its keeps coming back. What to do? Tip 1: Boot in Safe Mode – Restart your PC in Safe Mode. After booting into Safe Mode, go to Control Panel > Network and Internet > Internet Options > LAN settings and uncheck the box “Use the proxy server for your LAN”. Tip 2: Login as Administrator – If you cannot uncheck the box, then login to your PC as administrator. Right-click on Chrome and select Run as Administrator. Now go to LAN settings from the Chrome settings. To do this, click on Chrome Menu > Settings > scroll down and click on Change Proxy settings. It will open the Internet Properties dialogue box. From here go to Connection and click on LAN settings. Now uncheck the box “Use the proxy server for your LAN (These settings will not apply to Dial-up or VPN connection). Also, check the box “Automatically detect settings”. Tip 3: Remove Proxy Address – Click the Chrome Menu (three horizontal bars) and select Settings. Scroll down, Show advanced settings, click on Change proxy settings. From the Internet Properties, click on Connection tab and then click the LAN settings button. Go to Proxy server section and click on Advanced button. A new dialogue box will appear. Clear all the proxy address and port number from the proxy server address. Click OK to save the settings. Close Chrome browser and open it again and see if the error has been resolved. If you have recently updated your PC to the new Windows update, then you might experience “can’t connect to the proxy server” error. So, what you can do here is that revert to Windows update when you were not facing the “can’t connect to the proxy server” error. You might be able to do this using the Windows restore point. You can find settings to restore the earlier restore point in the restore settings of your Windows PC. The “can’t connect to the proxy server” issue can also occur if a malicious or adware tool got installed on your PC. Some of the most common tools causing these problems are Wajam (an adware tool), browser security etc. Remove Wajam – Go to Control Panel > Programs > Uninstall Program > Programs and Features. In the list of installed programs, look for any software named as Wajam. Uninstall it. Also, check for any Wajam extension in your Chrome browser. If you find any wajam extension, disable and remove it as well. Remove Browser Security – Browser Security is yet another utility that you would never know has been installed on your PC. So go to Control Panel, Uninstall Program > Program, and Features and remove anything named as Software security. Remove TeamView 9 – First, look in the system tray and exit TeamView 9 if it is running. Then go to Control Panel > Programs and features and remove / uninstall TeamView 9. Additionally, look for the software that you think you didn’t install and remove them if you find them suspicious. Don’t uninstall any system related updates. If you had Java installed previously, then go to Control Panel > Program and Features and look for Java in the installed programs list. If you don’t find Java installed, but you are sure that you have it installed, then try installing Java. Once installed, go to Chrome or Edge and open any web page and see if the “can’t connect to the proxy server” has been resolved. Click on the Chrome Menu (three horizontal bars) and select Settings. Scroll down to the bottom of the page and click on Reset Settings. Confirm the decision by clicking on Reset button. Now open Google Chrome and see if the can’t connect to the server error has been resolved. Tip 2 works!! Hurrah! I can use YouTube! I was having the problem of “Can’t connect to Proxy Server” message on my windows edge. I am able to solve the problem following your steps explained in Fix 2-disable proxy for LAN. Thank you so much. Tip number 2 did it. Thank you very much! Fix 2 worked like a charm. Thank you so much.